Sylvan housing reaches new heights with these wonderful dewdrop shaped Treetents by Dutch sculptor and designer Dré Wapenaar. Originally designed to ease the lives of tree-sitting activists, they also make excellent treetop retreats for campers, kids, and anyone soothed by an evening spent softly swaying among the branches. Each beautifully formed droplet attaches directly to a tree trunk and is roomy enough to sleep a family of four. If you’re interested in spending an evening amid the evergreens, several Treetents are available for rent 5 months out of the year at the Hertshoorn campground in the Netherlands. The bears will have fun playing with these. how much? where do i get it? do you need a canadian distributer? LOL they're made for treehuggers trying to stop people from cutting down trees, but the "sleeping platform" is made of hardwood. I feel bad for the trees! In the last photo, the tent straps are cutting into the trunk of the tree! "roomy hardwood sleeping platform", I was hoping it would be portable. they look cool, however, they are putting an enoromous amount of strain on the trees (observe that the trees are slanted). You can see more examples at this collection of treetents at urbanarbolismo. 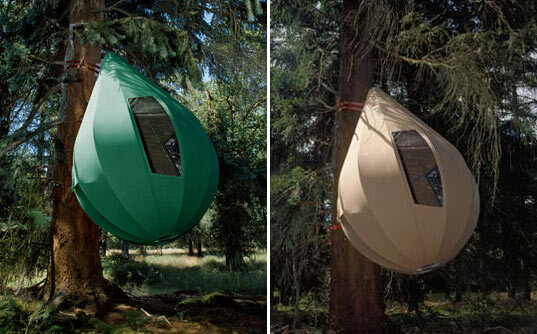 Can you buy these tree tents? How much are they? This is too cool! Love the novelty and invention. I bet they're really pricey though. According to Dré Wapenaar, "The story of my tents as they relate to campsites, however, started with the Treetents which were originally designed for the Road Alert Group in England. This group of activists fight against the excessive constructing of highways through forests. During their protest they cover themselves and hide and live in the trees to fight as long as possible against the rushing violence of the chain sawers. The Treetents would provide a comfortable place for them to stay during their habitation of the forest and prevent the trees from being cut down." Wapenaar's treehouse tents are composed of a steel frame wrapped in canvas and measure thirteen feet tall with a 9 foot diameter. The interior is outfitted with a roomy hardwood sleeping platform and a round mattress roomy enough for two adults and two children. According to Wapenaar, "the form of these tents naturally developed itself, when I hung a circular platform with a rope on the side of a tree." If you're interested in spending an evening amid the evergreens, several Treetents are available for rent 5 months out of the year at the Hertshoorn campground in the Netherlands. Wapenaar says "My inspiration for the shape was not the dewdrop. Form followed function."